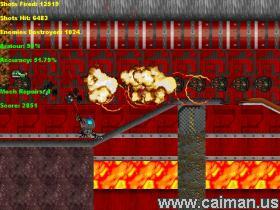 Caiman free games: WalkerMech Destroyer by Oddwarg. In WalkerMech Destroyer you control the guns on a automatic warrior robot. The robot does not stop moving until you get to the Boss and to continue, you must destroy it! Along your way pick up, up to 5 different weapons. And you might even gain an extra repair kit for your robot. Shooting is what this game is all about. 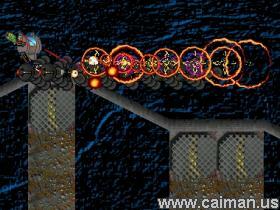 There is plenty of hot action in this game with various flying enemies appearing from all around. You must destroy them first, before they gradually eat away at you armour, requiring you to use a repair kit. You start off with six repair kits but those could all be gone very quickly if you are not careful. Ther are three levels of dificulty: easy, normal and hard with normal being the default. The difference between the three levels is the speed at which the robot walks, the speed at which the enemies come at you and of course the higher the level the higher the score that you can get. 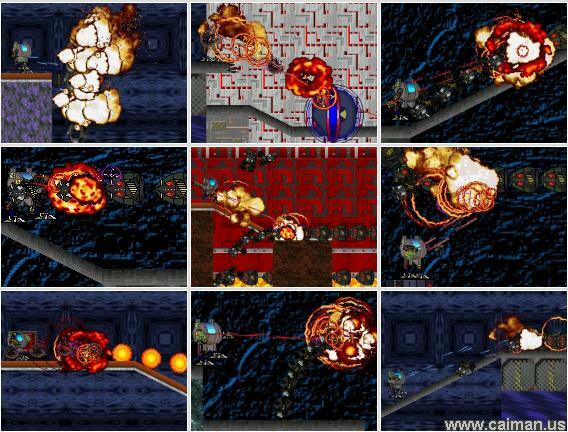 With the great sound effects and stero music WalkerMech Destroyer is one high class game.